–from Alberto Kalach by Miguel Adria, published by Gustavo Gili, 2004. - from www.popularmechanics.com, “The World’s 18 Strangest Parking Garages”, by Brian Resnick. Throughout the downtown areas of Japanese cities, automated parking towers intermingle with office towers. This urban vernacular building typology developed during the post-war economic growth that began in the 1960’s. 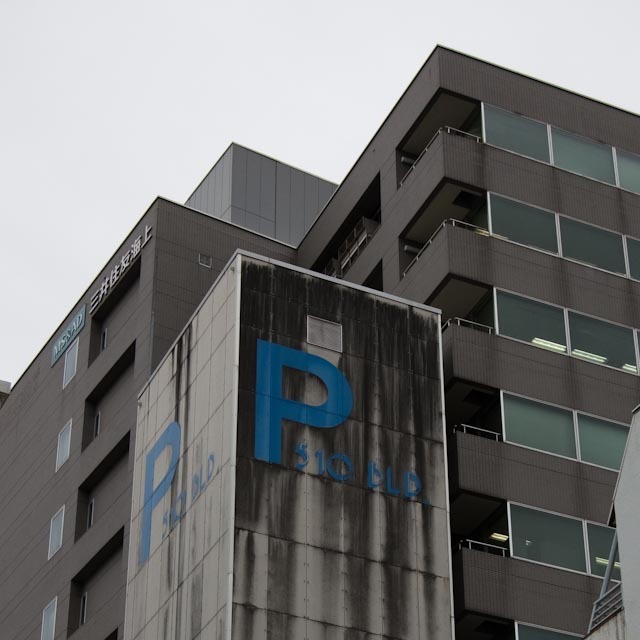 Japan’s rapid progress of motorization created the demand for large quantities of automobile parking to be located as close as possible to office buildings. The desire of property owners to obtain maximum return on their property with minimum investment of infrastructure, paralleled with increasing land costs, gave birth to the automated parking tower. Automated parking towers are houses for cars. They are briefly inhabited by humans only when the access of cars is necessary or desirable. Cars enter and leave the tower through a single door opening, which typically consists of a vertical lifting garage door. After drivers have left their car at the ground floor level of the parking tower, an automated parking system hoists the car into a storage position in the tower above. There are two primary parking systems used inside parking towers. The carousel-type parking system consists of rotating automobile platforms hung from a chain, functioning in manner similar to a Ferris wheel. Maximum storage efficiency results since no circulation space is required throughout the tower, so this system is often used for sites with very small footprints. The elevator-type system consists of parking spaces stacked one above the other, and positioned on both sides of an elevator. While the elevator requires valuable circulation space throughout the tower, movement of cars can occur both vertically as well as horizontally, making it a more appropriate system for sites with larger footprints. Both systems eliminate the need for vehicle circulation, including on and off ramp infrastructure. Automated parking towers are primitive yet extreme buildings. The shape and dimensions of the parking tower are directly determined by site constraints, height limits, and automobile dimensions. Because of high land costs and the desire to provide as much parking as possible, the towers are extremely slim and tall. Steel braced frame construction is utilized to permit economic and rapid construction, with the capability to resist high seismic loads. With no need for views or natural light, the structures have no windows or openings other than the car access door at the base of the structure. Since the automated parking system consists of a series of floating trays which move throughout the building, the tower has no fixed floors. The buildings are not conditioned or insulated. Exterior cladding, either metal siding or cement panel siding, is attached to the outside of the steel structure to provide weather protection to the automobiles suspended in the air. Automated parking towers are easily identified. Their lack of fenestration and architectural detail contrasts with the glass office towers that stand beside them. 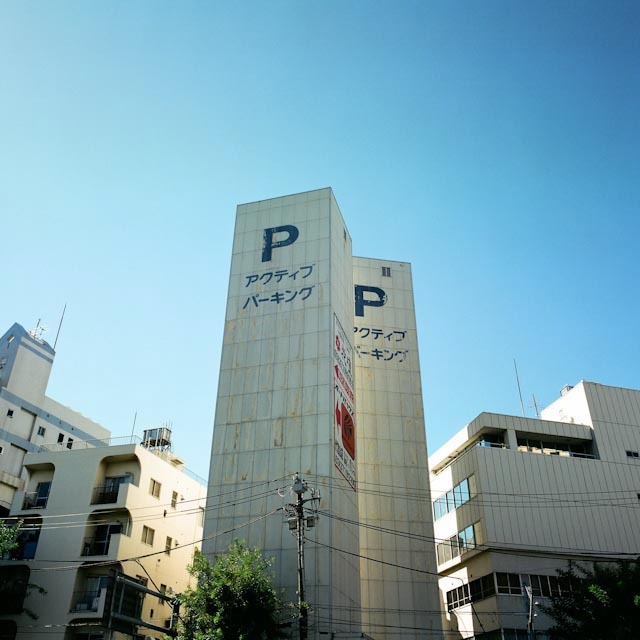 A prominent letter “P” is typically painted on all four facades of the upper portion of the tower, serving as a navigation aid from afar for vehicles that have no GPS system. Yet despite their excess quantities, the towers are anonymous. They all look the same; none stand out more or less from the others. They are stationary landmarks in a moving field of cars; only the convenience of their location and their pronouncement as a parking tower is of relevance. Automated parking towers are typically set back from the street, creating an intermediate space between street and tower entrance. The outdoor space serves as a threshold where the parking attendant interacts with the customer and operates the parking tower carousel or elevator through a control panel mounted adjacent to the tower entrance. Turntables recessed in the paving in front of the access door complement the efficiency of the operation, permitting cars to be turned 180 degrees like locomotives at a roundhouse. When the access door is in the open position, the depth of this intermediate space is extended into the parking tower itself. A large mirror installed at the rear of the parking tower (to assist drivers in the appropriate placement of their car on the carousel tray) extends the intermediate space to infinity. When viewed from across the street, the numerous personal and mechanical interactions that occur at this unique street level intersection become apparent over time. Parking attendants, customers, vending machines, vehicles, pedestrians, and bicyclists begin to appear like actors on a stage, with the parked car serving the role of protagonist. The experience is theatrical, allowing the patient viewer to transform random occurrences into an imaginary street performance. The stage alternates between the turntable in the foreground and the interior of the parking tower in the background, with the access door serving as the stage curtain. A sort of ongoing ‘real-life’ theater results, subtly revealing lifestyles, customs and interactions, and illuminating the ways in which people use the city over the course of the day and night. The ubiquitous automated parking tower is a necessary and relevant infrastructure, providing convenient access for workers and visitors to the dense urban conditions which typify Japanese cities. Their excess will only be mediated over time with the reduction of automobile usage. Until then, these anonymous and seemingly monotonous buildings will continue to serve their purpose. The everyday performance between cars and people will remain in the City’s subconscious.